An eclectic collection of Percussion Quartets for Drummers and Percussionists of all performance levels, beginners to advanced. FREE CD's, Special offer: order any sheet music titles by Thomas Marceau or Robert E. Kreutz and receive a complimentary CD of their compositions. The 15th annual Italy Percussion Competition and Festival will be held in September (2017) in Montesilvano-Pescara (Italy). The festival features an international panel of judges and performers and will host students from around the globe. Also available, for percussion ensemble: Love Triangles for Percussion Trio. quartet - each performer utilizes a set-up of drums and/or small percussion instruments: claves, temple blocks, maracas, congas, bongos, log drum, woodblocks, toms and cymbals. composition was to take certain important themes from the Creation narrative in the Bible and turn them into musical motives, and then use these motives to develop musical material. The process of turning events from the book of Genesis into musical material was fairly straightforward. By simply taking the transliteration of certain key words and breaking them up into syllables, the composer could then base the motives on 1) the rhythmic syllabification and 2) the natural Hebrew inflection. The work as a whole is not intended to symbolize the Creation. It simply represents the primitive and raw forces that were used in the creative act. Of particular importance is the motive for "God," which is represented in the log drum and is featured throughout the work as a sort of recurring theme. adv. high school/college. the "quirky" melodic lines that permeate the work. vibraphone, xylophone and glock., marimbas (2 - one 5 octave) and an array of small percussion (cymbals, cow bells, toms, etc.). Scored for four multi-percussionists, the title Border Crossing refers to the intermingling of contemporary classical and popular styles in this composer's music. The climactic final section of this piece for four players is intended to express a sense of celebration. adv. high school/college. Three movement work scored for four multi-percussionists. Inspired by encounters with a number of varieties of cacti in the American South West. All players read from a full score - parts are one-sided and to accomplish page turns, players may lay parts out on a larger piece of cardboard or construction paper - to fit on two music stands. Players can see all parts simultaneously and consequently the piece can be played without conductor if desired. Snare drum quartet in three movements - optional additional player(s) on cymbals and bass drum. The term "Chamade" is derived from an old French military expression for a drum (or trumpet) signal for a cease fire. This unique suite of three movements is in fact a concert version of a series of military drum signals. Players utilize a variety of sticking techniques, adv. high school/college. Based on interlocking ostinati, this quartet will be useful for the teaching of dynamic concepts and syncopation at an easy level. The piece can be performed while standing or seated and more than one person can play each part. While the rhythms consist of only quarter and eighth notes and their corresponding rests, the tempo moves at a very quick pace and much attention must be given to realizing the nuances called for by the various playing techniques: foot stamp, leg slap, hand clap, finger clicks and tapping the palm with two fingers. Concerto for Darabukka and Percussion Quartet, explores three traditional Middle Eastern Iqa’at (rhythmic cycles): Masmudi Kabir (8/4 time signature), Jourjunah (10/8), and Karachi (2/4), as well as one original cycle set in 12/8. Structured in a modified rondo form and requiring extensive improvisation by the soloist, the work combines traditional Middle Eastern percussion instruments with instruments from Eastern Asia, South America, and the Caribbean. Scored for four multi-percussionists, this work explores in a contemporary fashion, the various thicknesses of sonic texture to be found within a particular grouping of percussion instruments. Full of contemporary rhythmic configurations and performance procedures - approx. six minutes. college/professional. A piece of moderate difficulty for two or more players using all membrane percussion surfaces - requiring focused concentration and attention to nuance. The interchanging accents and stereophonically treated sounds, with players dueling, make this an effective and exciting work. Do You Hear the Bells Sing...? 3rd place winner in the 2011 PAS Italy Composition Contest. A unique percussion quartet that makes use of a wide variety of cymbals - Western, as well as Chinese and Tibetan, with an assortment of crotales played with a bow. Performance will require a great deal of nuance and finesse! See score samples for a complete list of instruments. Scored in a lively Latin/Rock groove for two marimbas (4-octave), percussion and bass, the piece can be played as a duet with accompaniment track (percussion and bass on CD). Or it can be played without the recorded accompaniment and opened up to include a number of players on percussion/drum set and bass to make a small ensemble. Mallet parts require basic 4-mallet technique. Scored for 4 players, this ensemble can be played on four concert snare drums, or a combination of "military" or marching snare drums. A fun and challenging work-out for a batch of snare drummers! Scored for four multi=percussionists. Each player utilizes a number of drums (either timbales, toms, bongos, congas . . .) as well as a variety of small percussion instruments: including cymbals, wood blocks, brake drum, sand blocks . . . Very rhythmic, based on evolving interlocking patterns - Grooves! Challenging, for more experienced players. Challenging percussion quartet full of Intricate rhythmic figures and subtle dynamic nuances. Scored for four multi-percussion set-ups. Instrumentation includes: marimba, vibraphone, timpani (29") and an array of drums and small percussion - including cymbals, sleigh bells, wood blocks, cabasa and rainstick. college. Scored for two flutists and two percussionists, this moderately difficult piece requires tight ensemble playing featuring the vibraphone and marimba. An ideal recital piece. college. Scored for four players, each with a hi-hat and woodblock (graduated from highest to lowest in pitch), this piece offers some unique interaction between the parts. Players utilize “open” and “closed” hi-hat as well as stick clicks and woodblocks to achieve some interesting visual and aural effects. 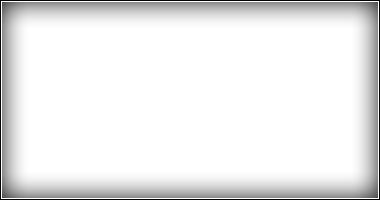 A unique piece that would work as an up-tempo opening number or as an encore piece, as it is fairly short in duration. Younger players may have to spend some time working out the patterns to facilitate the musical nuances, while more experienced players should be able to put the piece together in a short time. Challenging, up-tempo groove oriented piece for four players, each of which utilize a mallet instrument and small percussion set-up - sometimes simultaneously! Instrumentation: xylophone, vibraphone and marimbas (2) as well as bongos, cowbells (2), assorted toms, bass drum, log drums (4 pitches), congas (2), small gongs (2) and several cymbals. high school/college. This piece will add a unique aural and visual statement to any recital program. Each of the four players sits on the floor and drums on the floor surface with snare drum sticks. While the rhythms are straightforward and would be accessible to younger as well as more experienced ensembles, the accents, stick clicks (including striking the sticks of adjacent players) and movements (leaning forward and to the sides) must be well coordinated for the best possible effect. This percussion quartet offers a challenging workout in 7/8. Scored for tupan (or large floor tom/small bass drum), tambourine, cowbell, whistles (3), wood blocks (2), bongos (2), and drum set, this work can be opened up for solos between players, the movement of players through the audience - while playing, and audience participation as well. adv. high school/college. 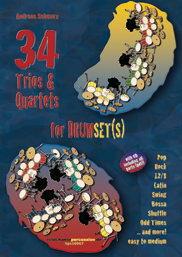 This collection contains 34 drumset trios and quartets suitable for beginners as well as those who are a little more advanced. If you already know my two-volume DRUM METHOD, then you are going to know roughly what to expect from this book; if not, then why not take a look at these study materials as well? I have noticed that young drummers greatly prefer practicing and particularly performing in groups rather than alone. This positive experience, which started with a group performance of about 10 pieces in 2008, has led me to write and publish a complete collection, in many styles and time signatures. I hope this book will give your young drummers a lot of happiness and motivation. This is an up-tempo quartet, scored for four drums (graduated in pitch), as well as cowbell, temple block, ride cymbal and tambourine. Each of the players move back and forth between their drum and auxiliary instrument (all mounted on stands) throughout the brief piece and utilize foot stamps and stick clicks as well. A lot of dynamic contrast is called for in this brisk 6/8 romp! Accessible to both performers and audience, this quartet, scored in a neo-Classical style, would make a pleasant addition to any concert program. adv high school/college. Scored for three marimbas (one with low F) and xylophone, this is a lively setting of an interesting piece of Americana. While the individual parts are not too difficult (each requires two mallets), the interlocking nature of the overall texture requires concentrated attention to detail. A great piece for developing " ensemble listening" skills! The Banjo was one of many piano works written by Gottschalk for his own performances and dates from his first American tour (1853-56) after his return from Europe. In the rhythmic material of the piece, one can easily hear the sounds of the strumming of the banjo enjoyed by Gottschalk in his early years, as well as a passing reference to Stephen Foster's Camptown Races. Scored for four players, this piece makes interesting use of tonal colors and rhythmic syncopations. All parts are written for two mallets and the piece requires a 5-octave instrument and a 4 1/3 octave instrument - with two players performing on each. This would make a unique addition to a marimba or percussion ensemble program, as the focus is not so much on the percussive qualities of the marimbas, as it is on the tonal/harmonic “colors” that can be derived from the instruments. high school/college. The title of this tune is derived from a city in the Chiapas region of Mexico. This arrangement for four or more players in a Mesoamerican style, can be performed with percussion accompaniment as a bolero, samba, etc. high school/college. This is a crowd-pleasing feature for a marimba soloist - scored for marimba trio and Bodhran (tom tom, or other drum could substitute). Great if you have at least one 5-octave instrument, but can be easily adapted to 4 1/3 octave instruments. adv. high school/college. A challenging mallet percussion quartet, In Circles displays intricate melodic counterpoint between parts in a Baroque-style round with a contemporary touch. This piece may be played without a conductor, and performers should face each other, towards the center of the circle of instruments. Instrumentation: xylophone, vibraphone, marimba 1, marimba 2 - (low A). This tune, scored for four or more players, is a Mexican favorite and features lots of chromatics and a secondary dominant that gives it a wonderful Mesoamerican flavor. high school/college. This arrangement, for four or more players, offers quick tempos and lots of notes with open solo space in the middle. Players as well as audiences will welcome this tune with a distinct Mesoamerican style. (requires marimba with low F) high school/college. A bit of minimalism meets some African influence . . . . with a flitting melody . . . . flying lightly . . . . Up-tempo ensemble, scored for four players on two marimbas - requires one instrument with low F. Anchored by an ostinato in the fourth marimba part, the other three players trade short melodies and weave in and out of interlocking rhythmic figures. No one part is particularly difficult - only the fourth marimba part would require more than two mallets - yet focused concentration is required so as to realize the melo-rhythmic patterns in a fashion that seems relaxed, yet grooves. 3rd place winner in the 2000 PAS Composition Contest, Marimba Quartet is a virtuosic, 17 minute piece written in the four-movement structure of a classical string quartet. The first movement is highly neo-classical, in sonata-allegro form. The second utilizes a cyclic, self-transposing, jazzy harmonic progression in one voice as a foundation for floating melodic ideas in the other three parts. The third, "Scherzo Rhythmicus," is a tour de force in 20 eighth-note time, leading to a surprising 3/8 conclusion. The final movement is an all-out chromatic race (a la Dimitri Shostakovich) to the climatic final triad! (4, 4.3, 4.6 and 5 octave instruments required) college/professional. A collection of six catchy titles arranged for marimba quartet - 4 players on one instrument! Based on Jarocho music of the Vera Cruz region of Mexico. Viable for percussion ensemble concerts - or any festive occasion! This arrangement of Boccherini's widely known work is scored for four mallet players: xylophone (vibraphone), vibraphone, and two marimbas (parts can be adjusted so as to be playable on one marimba). high school/college. This is a very rhythmic piece scored for four marimba players, each utilizing two mallets. The works’ interlocking patterns propel it along from start to finish - very audience friendly! Requires one 5- and two 4 1/3-octave instruments. Scored for xylophone and three marimbas (one 4 1/3 octave required) this contemporary RAG features all the players, this is not just a solo with accompaniment, but rather offers appealing interaction between all the voices. Fun to play and audience friendly as well. high school/college. Up-tempo rag scored for xylophone, marimba (two players - one instrument) and drum set. Can be opened up for extended drum solo, all mallet parts require three mallets. high school/college. Challenging marimba quartet - ca. 6' 03" in duration. Placid Landscapes are based in F minor, and subsequently shift down by step to Eb and Db. The piece is in three sections that clearly contrast each other, yet each is based on the original harmonic building blocks stated from the very beginning. The accompanying parts are built around the bass marimba patterns and compliment them by creating a dense counterpoint that is very rhythmic, yet harmonically static. The bass part requires a performer with solid four-mallet technique and above average endurance - double and triple lateral strokes are involved almost continuously. The upper parts (players 1-3) are much easier technically, but far more difficult rhythmically. The second and third portions of the work require very carefully sequenced ideas that are linear in construction. An improvised drum part (djembe or cajon) can be added that should groove heavily, and weave itself around the rhythmic ideas presented in all four marimba parts. college/professional. for four or more players, can be "opened up"
... make a joyful noise! Copyright © 2017 - HoneyRock Publishing - All Rights Reserved.